One of my very first posts back in 2004 was about a light fixture I had made for my hallway. 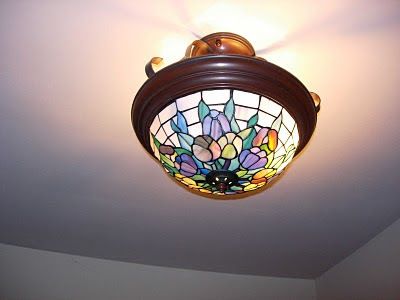 Then in 2007, I posted about glass shade I picked up for a steal at a local salvage shop (the round shade in the first link will eventually be used in my basement stairwell). Optimistic that I would have the new light installed very soon, a year ago I donated the light that was there to a friend. I have since been living with bare wires. In keeping with the every three years theme I have going, today I can finally report that the box has been totally rewired and my new light and shade have been installed. The wiring up there was a scary, tangled mess of old wires, tape and dust. Big box light that was there when I moved in. The new light. The shade has an opal kind of glow that the photos don't capture well. You can also ignore the circle of paint surrounding the base of the light. I will never understand people that paint a ceiling and paint around lights rather than loosen the base and paint under them . Looks great! Isn't it amazing how such a small thing can have such a big impact?! The house I grew up in had lights like these in the bedrooms. I love it!